In the last half century, drywall (also known as Sheetrock, wallboard or plaster board) has replaced plaster/lath as the material used for interior walls. First developed over a century ago,1 drywall consists of gypsum sandwiched between two external layers of paper. The ease of use and installation of drywall didn’t catch on right away, however, as many people still preferred the look and tradition of wall construction using plaster. With the construction boom that took place at the end of WWII, the popularity of drywall surpassed that of plaster and drywall remains the building material of choice for interior wall construction. However, the very nature of drywall construction (heavy paper exterior) leads to the need for repairs, as damage to the wall itself is all too common. Small holes in drywall (often caused by moving furniture, table corners, chairs etc.) can usually be repaired only using joint compound to patch the hole. 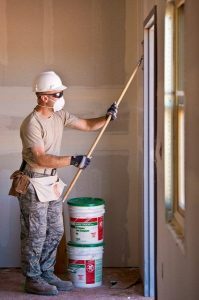 Joint compound, also called mud, mastic or joint cement, consists of a mixture of materials that approximates the consistency of mashed potatoes, spreads easily on drywall and dries within a day. It can be easily sanded to evenly blend with the rest of the wall and the mud takes a finish (usually paint) extremely well. In fact, once painted, it’s often difficult to tell that the wall has been patched. To repair small holes, apply the mud liberally over the hole, feather the excess mud away from the hole and allow it to dry for at least 24 hours. Often, when filling a hole entirely with joint compound, the compound needs a little extra time to fully cure. Once assured the mud has dried completely, sand the affected area smooth and reapply a second thinner coat if necessary. When the final coat has dried, sand it smooth with the rest of the wall and refinish (paint, wallpaper etc.). However, some holes come in larger sizes (doorknobs, or the size of a fist—often occurring when a football fan watches his team fall in Champions League play) and require a different approach for repair. When repairing something too large to use only joint compound, it’s time to patch the wall itself. Home centers often offer small sheets of drywall for this very purpose (24” x 24” US; 61 x 61 cm metric), alleviating the burden of needing to handle the massive and heavy sheets of drywall. The damage created by a fist is usually irregularly shaped, so the first part of the repair requires the hole be made into a ‘regular’ shape. A square usually works well. Once the hole in the wall has been turned into a more regular shape, cut the patch to fit in the new opening. Make this patch slightly smaller than the opening itself (1/8th” in the US, ~ 3 mm metric) to allow for some irregularity and for the mud to fill. However, this patch needs something behind it for structural support, otherwise it’s too susceptible to get pushed into the wall itself. To support the patch, put a backer strip of wood on the inside of the wall and attach it to the rest of the wall using drywall screws. One above and below the hole normally suffices. With the backer strip in place, put the patch into the hole and attach this to the backer strip. Usually one or two screws works fine here. Make sure the patch isn’t recessed in the wall or that it stands proud of the wall. The goal is to have the patch perfectly flush with the rest of the wall. Once this has been established, put mud in the gaps and feather out as described previously. Once the flush patch and mud have been sanded perfectly smooth, refinish the patch. This method works well for patches that aren’t too large (perhaps up to 30 x 30 cm; 12 x 12 inches—though these dimensions aren’t carved in stone). Repairing larger holes often requires extending the hole to expose one or more of the wall studs. For repairs of this magnitude, it’s often beneficial to use dedicated half or quarter sheets. Make the opening (caused by the initial damage) the size of your repair sheet and ensure that you have at least one wall stud to work with. This serves the purpose of the backer board in the previous section. If you can expose more than one wall stud, even if it means using a larger sheet for repair, do so. Attach the repair sheet to the stud(s) and mud the joints as described previously. The job goes a little faster at this stage if you use joint tape where the seams meet instead of just mud (though just using mud is perfectly fine!). Feather, sand and refinish.